ice that is not attached to the shoreline and drifts in response to winds, currents, and other forces; some prefer the generic term drift ice, and reserve pack ice to mean drift ice that is closely packed. a peaty permafrost mound possessing a core of alternating layers of segregated ice and peat or mineral soil material. a poorly-drained lowland underlain by organic-rich sediments, which contains perennially frozen peat bodies (peat plateaux) and, occasionally, palsas. pieces of new ice approximately circular, up to 10 centimeters (4 inches) thick and 0.03 to 3 meters (0.1 to 9.8 feet) in diameter, with raised edges that form from rubbing against each other; formed from the freezing together of grease ice, slush or shuga, or the reaking up of ice rind or nilas. in a mixture of gases, each gas has a partial pressure, which is the pressure the gas would have if it occupied that volume alone. ice-bearing permafrost in which some of the soil particles are not held together by ice. special design and construction methods used for engineering works in permafrost areas where preservation of the frozen condition is feasible. a foundation pile provided with a single-phase natural convection cooling system to remove heat from the ground. a foundation pile provided with a two-phase natural convection cooling system to remove heat from the ground. predominant characteristic of the weather which had existed at an observing station during a given period of time (during the preceding hour or six hours), specified in the international synop code. a collection of pack ice, less than 10 kilometers (6.2 miles) across, whose limits can be seen from the masthead. a general term for any ground surface exhibiting a discernibly ordered, more or less symmetrical, morphological pattern of ground and, where present, vegetation. a deposit consisting of decayed or partially decayed humified plant remains. a hummock consisting of peat. a generally flat-topped expanse of peat, elevated above the general surface of a peatland, and containing segregated ice that may or may not extend downward into the underlying mineral soil. the extreme relief of ablation hollows found most often at high altitudes in the tropics; the resulting spikes of snow resemble repentant souls. a layer of frozen ground which forms as part of the seasonally frozen ground (in areas free of permafrost or with a lowered permafrost table); remains frozen throughout one or several summers, and then thaws. the conditions, processes and landforms associated with cold, nonglacial environments. landforms and soil characteristics produced by periglacial processes. processes associated with frost action in cold, nonglacial environments. an artificial mixture of frozen soil materials cemented by pore ice, which forms a concrete-like construction material used in cold regions. the lower boundary surface of permafrost, above which temperatures are perennially below 0 degrees Celsius (cryotic) and below which temperatures are perennially above 0 degrees Celsius (noncryotic). (1) the geographical boundary between the continuous and discontinuous permafrost zones (2) the margin of a discrete body of permafrost. the total geographic area containing some amount of permafrost; typically reported in square kilometers. outermost (latitudinal) or lowest (altitudinal) limit of the occurrence of permafrost. a region in which the temperature of some or all of the ground below the seasonally freezing and thawing layer remains continuously at or below 0 degrees Celsius for at least two consecutive years. the upper boundary surface of permafrost. the vertical distance between the permafrost table and the permafrost base. 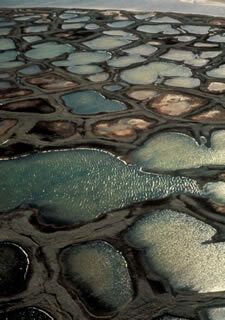 a major subdivision of a permafrost region. 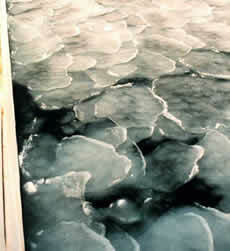 a region that is covered with sea ice year-round; most of the sea ice in the permanent ice zone is multiyear ice, but younger ice and open water may still be present; the permanent ice zone is what remains in summer after all melting has occurred (often called the summer minimum extent).